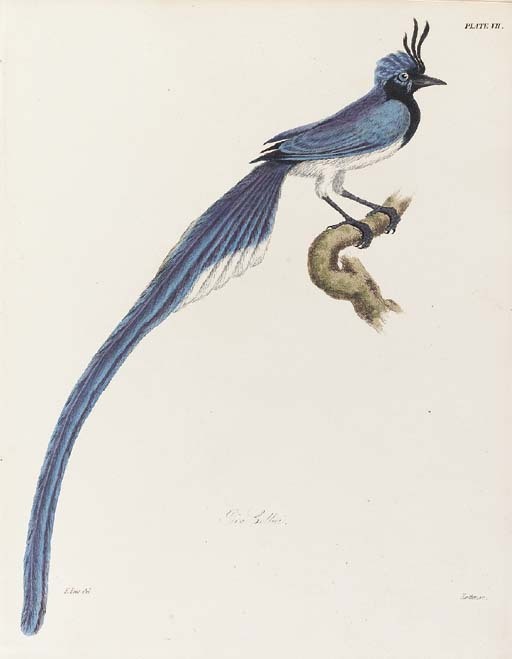 The Zoology of Captain Beechey's Voyage; compiled from the collections and notes made by Captain Beechey, the officers and naturalist of the expedition, during a voyage to the Pacific and Behring's Straits performed in His Majesty's Ship Blossom... in the years 1825, 26, 27, and 28. London: Howlett & Son for Henry G.Bohn, 1839. 4° (282 x 220mm). 44 hand-coloured engraved plates by J.C.Zeitter and T.Landseer after Edward Lear, J.D.C.Sowerby and Zeitter, 3 hand-coloured engraved maps and plans after Belcher (1 folding). (Lacking half-title, small crease to upper blank margin, small tear to lower blank margin of O1, stitching weak with some leaves loosely inserted.) Original green cloth, letterpress paper label on spine (spine slightly soiled, label slightly scuffed). Provenance: Charles Henry Gatty (inscription dated 'June 8. 1865'). FIRST EDITION, INCLUDING 'MUCH SCIENTIFIC DATA ABOUT ALASKA... AN IMPORTANT RECORD' (Lada/Mocarski). The contributors include many of the great names from the British scientific community of the period: Sir John Richardson (Mammalia), N.A.Vigors (Birds), G.T.Lay and E.T.Bennett (Fishes), Sir Richard Owen (Crustacea), John Edward Gray (Reptiles and Shells) and William Buckland (Geology). The plates include 14 after Edward Lear: 2 of mammals and 12 of birds. 'Beechey's expedition to the North Pacific, through the Bering Strait and as far as Point Barrow, had as its objective to meet Franklin and Perry and to convey them safety after theor polar expeditions. Beechey's voyage was productive of much scientific data about Alaska and [the present work] is an important record of these achievements' (Lada-Mocarski). Anker 517; Arctic Bibliography 1231; Fine Bird Books p.59; Lada-Mocarski 1-5; Nissen IVB 961; Sabin 71032; Wood p.229; Zimmer 51.